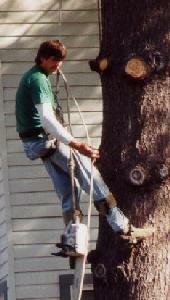 On this day in 1999, my neighbor Fred's 100ft (30m) tree was cut down by a professional tree company. Fred and I had argued over how much I should contribute to the removal fund -- me arguing more and he less. The tree technically terminated on his side of the fence, but it overshadowed both our properties and could easily have taken out either house, so he finally let me talk him into paying half. When we finally made the decision, I immediately thought of Donnie Boden. He was the man who had removed my mother's 100 year old 150ft oak tree a couple of years back after a sudden, quick, and violent wind squall scattered a huge swath of tree branches and trunks all throughout her neighborhood. The tree was probably 75ft of trunk straight up with a spray of huge branches at the top. The winds that night had rotated the tree so violently that it had snapped the 1/4" wires which had been supporting the huge branches. 1/3 of the tree had split off and dropped away from the house, disintegrating a large beach tree and 100ft of fencing in its path. If the other side of the tree had dropped, it would have probably done at least US$100k damage to my parents' house or the houses on either side. Over the next 24 hours, we talked to no less than 8-10 tree companies trying to get them to tackle the job. Since they were in such high demand, most said that they would come by to check out the job and never showed. Others arrived, gave a price which we accepted and then never returned. Of those that showed up, most expressed a palatable reluctance on taking the job given the size and the state of the tree. Without her wires and with a good portion of her back side on the ground, the tree seemed very unstable -- with creaking and cracking coming from her from even the most gentle of breezes. Two flatly said that the tree was too dangerous and wouldn't send any of their crew up it. We were becoming increasingly desperate. Somehow we heard about Blystone & Boden tree service and called them late in the evening. The phone did not answer but there was a home number associated with the business line which we tried. Buddy Blystone, one of the co-owners I believe, answered the phone himself and nonchalantly said that his team would be there the next morning at 0800. We hung up the phone not sure whether to let ourselves feel relieved. At 0750 the next morning Donnie Boden arrived with a truck and a single helper. He looked at the tree and said that we'd have to pay an emergency fee given the situation. His quote was 1/2 that of the others guys who had never returned. My mother said sure but asked when he could do it. "Oh, right now", was his reply. With that he put on his spurs, put a coil of rope on his hip, dangled a chainsaw from his belt, tied a security line around the trunk, and walked up the tree. Within no more than 15 minutes the largest limbs within range of the house had been removed and I was no longer afraid that it would come down on its own. It was quite amazing to watch him work. He walked out to the end of these monstrous limbs, 100ft in the air trailing a safety line looped over a nearby branch. The leafy ends of the branches were cut off quickly. He knew exactly the moment to turn off and drop the saw, turn around catch the branch as the last uncut bit of it separated from the tree, and drop it to the helper below. When he moved inwards and tackled the larger sections of the branches (some at least 2ft in diameter), he would tie two knots about a foot apart on the limb and then would notch and then cut the limb with the chainsaw. Again, he knew exactly the moment to turn off and drop the saw, tighten up the knot, and hang on to the branch as the limb would drop away. He would then pay out his side of the line and lower the branch to the ground. Often times a section of branch 8-10ft in length, probably weighing 100-200 pounds, would swing down and impact the bottom of where he was perched with a loud thud. Although the entire tree would shake, Donnie would calmly ride it out and again lower the piece quickly down to the ground. My mother had asked him to try and spare the birch tree below the big oak which other companies had mentioned would probably be destroyed when the oak was removed. He gave her a funny look at the time and said sure. Hardly a leaf was troubled as he lowered the branches down to his waiting helper. With larger branches he would calmly holler "headache" as they were coming down which implied what you'd get if you were underneath. He moved around the tree with an easy lanky motion -- moving from branch to branch to cut sections off while not severely imbalancing the oak. At one point when he wanted to move to a different branch he walked across 20 feet of one of the remaining 1/4" wires still left in the canopy. There was little wasted effort or energy and the tree was quick reduced to a towering column with nothing on top. By then the rest of his 10-15 member team had arrived and was clearing the yard and chipping all but the largest of branches. They would come back later with a crane to remove them and the rest of the trunk. I've mention these details in an attempt to have you join me in my appreciation of this expert. Here was a man eminently competent -- supremely experienced. It's not often that we get a chance to see someone so very good at what they do. The surgeon works while we are asleep and the differences between a good one and a great one are usually so subtle that only another surgeon can appreciate. Other professions are more publicly lauded such as Mario Lemieux, sprinting up ice with the puck, glancing quickly at the goal, looking back down at the puck, and turning and slapping it right in the upper corner of the goal. When I mentioned my appreciation of Donnie's skill to the Buddy Blystone, the co-owner of the company, as he himself paused to watch, he revealed his own level of respect for Donnie and said that he was without a doubt the best climber in the region. I make it a point to take the time to somewhat understand and appreciate other people's positions, whether its their job or their lives. I do this in an attempt to gain some insight into their perspective and point of view -- I think it helps me be a better person. Maybe in this case I was just impressed with a job that you will never catch me doing. Maybe his being the savior of my parents' house at an emotional moment swayed me strongly in his favor. These are both true but don't explain my level of respect for his skills. I am positive that I witnessed a great craftsman at work that day. A true master of what he does. An expert. So my hat goes off for one Donnie Boden of Blystone & Boden. It was extremely impressive to watch you work and I am so very glad to have had the opportunity to do so.